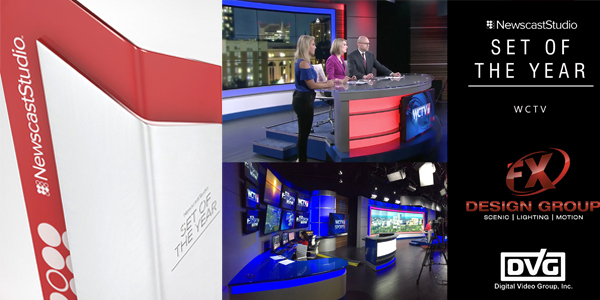 WCTV wins set of the year in the NewscastStudio Fan Vote at NAB Show 2018! DVG proud to be part of this project with our friends at FX Design Group! The set was designed and built by FX Design Group and DVG provided the onset technologies to bring the project together. This clean design combines a large video wall background along with bold backlit surfaces and additional monitor arrays in the weather center. Pictured: Mack McLaughlin, CEO & Creative Director FX Design – Alex Martin, CEO Digital Video Group, Inc.
DVG also received honorable mention for AV design for WCIU In Chicago!! Details on Both Projects Can be found here!